This beautiful place is privately owned. The owners don't want attention called to their property. Therefore, I haven't listed the name of this place, or the name of any of the features found here. Furthermore, the photos in this gallery are not being offered for sale. This ultra wide angle view is an attempt to show (in one photograph) most of the attractions here. The two openings on the right side of the photograph are arches. The larger of the two arches is on the right, but only a portion of that arch can be seen in this view. The rock ledge in the foreground is actually the top of another arch. The largest arch here is the natural bridge on the left. 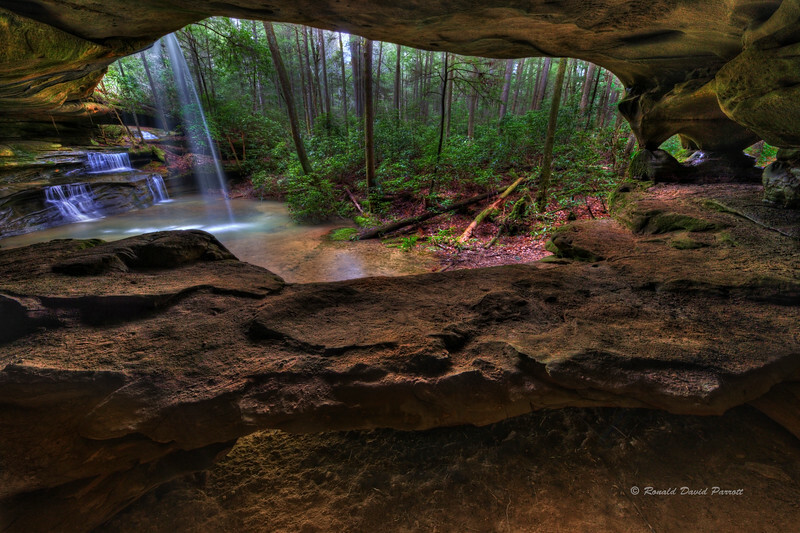 This photo was taken from inside one room of a two room rock shelter. The other room is off the left edge of this photo. It contains the smallest arch at this location. You can only see through that arch by putting your head down in a depression inside the rock shelter, or by standing in the splash pool. This concentrated collection of natural wonders make this a very unique and appealing spot. Just imagine what it might have been like hundreds or thousands of years ago to call this place home. I suspect most people would find great pleasure in being lulled to sleep by the sound of these waterfalls, and then waking up to this view. I certainly enjoyed taking shelter here on this dark and rainy day.